Lightning strikes routinely go unseen in Nevada’s remote, unpeopled mountain ranges. But when a bolt cracked a lone ponderosa pine on the Sheep Range in August 2012, some scientists in Reno took note. This tree, like dozens of others across the Great Basin, was rigged with a suite of sensors measuring its growth and sap flow by the minute while beaming data back to scientists. The lightning didn’t spark a wildfire, but it did cause quite a data gap. “It blew quite a few sensors and instruments away,” said Scotty Strachan, coordinator of environmental research for the University of Nevada, Reno’s department of geography. The department’s DendroLab is among several research groups participating in a National Science Foundation initiative to monitor tree growth and other environmental and climate variables across Nevada. The tree monitoring network is part of a project that aims to refine the science of dendrochronology, which uses tree rings to reconstruct what the climate looked like thousands of years ago and model how it might change in the future. At four sites across two mountain ranges, the research group outfitted several conifer species with instruments that monitor biological functions like sap flow and stem growth. But just as important is each site’s host of environmental sensors that measure climatic variables like air temperature, precipitation and soil moisture. Why is measuring tree growth and these environmental parameters at the same location a big deal? The heart of tree ring studies lies in comparing annual growth lines with climate data, either recorded or modeled. By understanding the relationships between tree growth and changes in environmental conditions, scientists can use tree ring records to create a reasonable picture of what temperature and precipitation patterns were like thousands of years in the past. But scientists often have to settle for climate data that wasn’t collected anywhere near the trees they’re studying. And the farther away the data was collected, the less representative it is of the conditions that were influencing a tree’s growth as it laid down its annual rings. It’s especially a problem in mountainous landscapes where the topography varies greatly and the local climate changes with it. That’s the case in the Great Basin where the tree instruments are deployed. Installing and testing the tree growth sensors alongside environmental monitoring stations has been an important first step in quantifying those uncertainties. 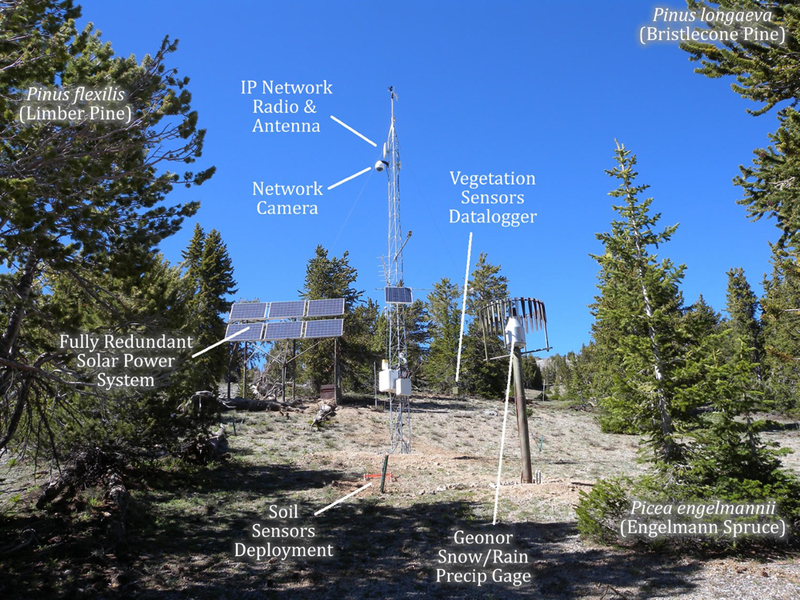 These sensors are in place as part of a larger climatic, ecologic and hydrologic monitoring network in Nevada funded through the National Science Foundation’s Office of Experimental Program to Stimulate Competitive Research, or EPSCoR. Around a dozen towers installed in remote, mountainous locations will give researchers important data from locations they otherwise might not have been able to access using equipment they might not have been able to afford. “By creating open baseline data that are being measured in exactly the same way at all the towers, and then providing these to individual researchers, they can then address science questions within their areas of expertise going into the future without having to foot the bill for this infrastructure that’s been put in place,” Strachan said.